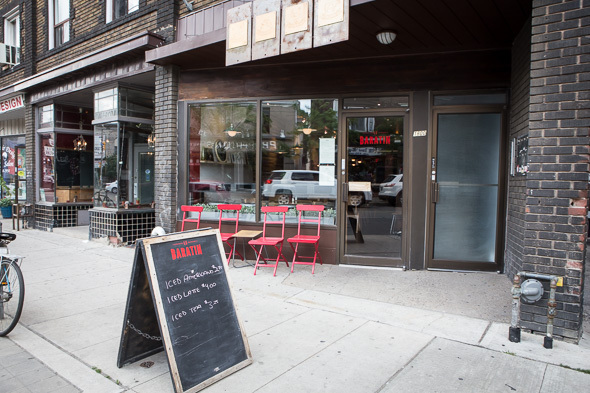 Le Baratin is the new Bivy cafe, but now it's a French bistro. 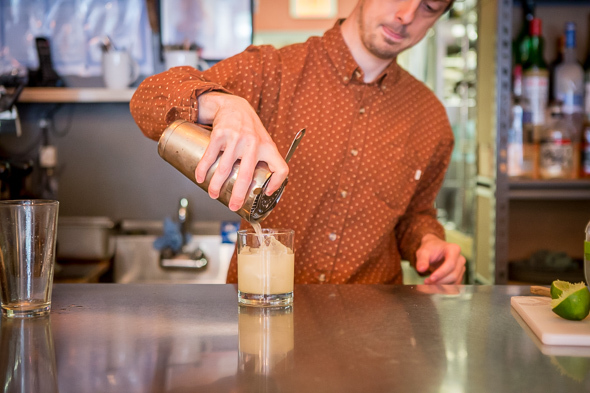 It still serves brunch and feels perfectly casual and cozy, but now owner Pascal Vernhes has turned the reigns over to ex- Le Paradis chef Jean Regis Raynaud. 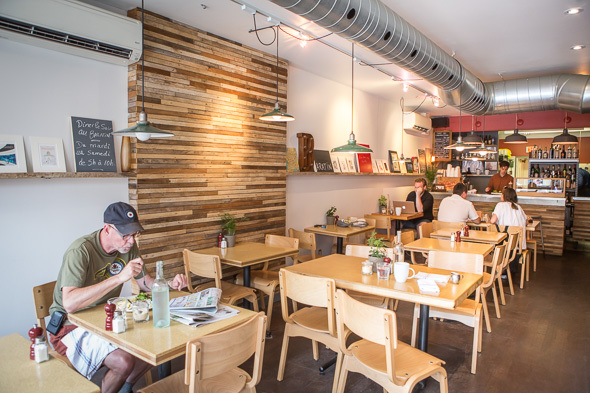 Together they're serving up a menu of wholesome bistro fare, while avoiding the cliches associated with most French restaurants. Vernhes references Montreal and France when he says bistros don't need to be fancy and a $40 dinner for two is commonplace. 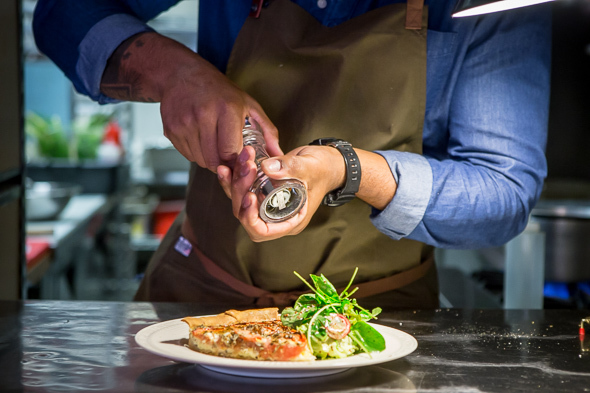 With Le Baratin, the goal is to make the experience approachable and affordable, while showcasing comforting classics that are too good to be reserved for special occasions. Seasonal influences will certainly sway the menu and the tarte Provencale ($9) on offer today is a lovely example. The deep torte, filled with tomatoes and chevre, boasts a flaky crust and the savoury filling highlights tomatoes as they're coming into their prime. 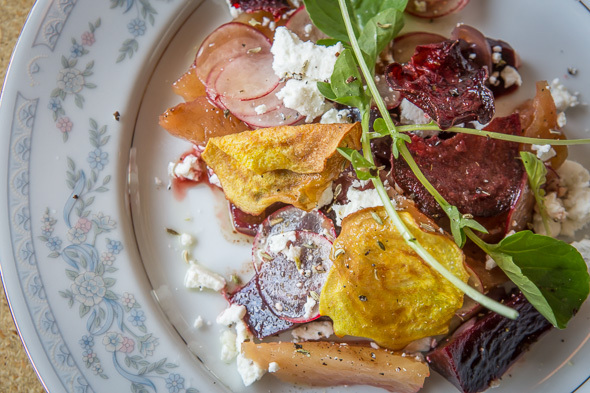 The beet salad ($8) features roasted beetroot wedges tossed in a cumin dressing and topped with pickled onions, goat cheese and thin beet chips. A summery cocktail seems appropriate at this point and the elderflower gimlet ($10) hits the spot. House wines from $8 a glass are equally attractive and make me a little envious of the locals nearby. 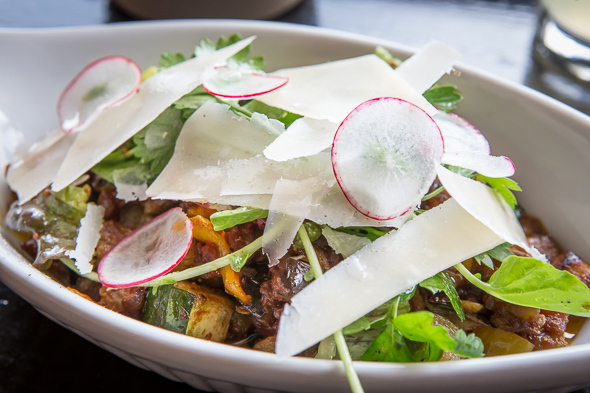 The list of Plats Principaux includes classics like steak frites ($19) and duck confit ($18). 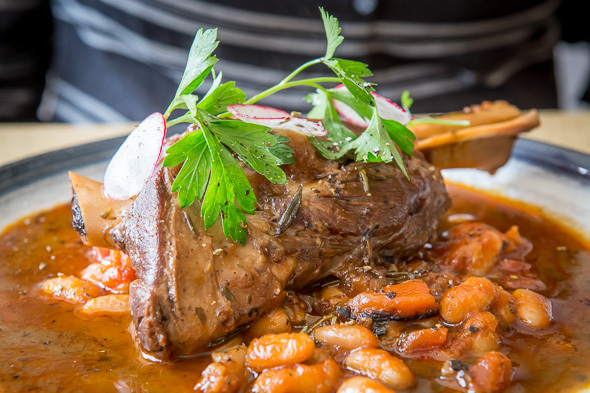 The five-hour braised lamb shank ($21) is the only dish on the menu priced over $20. It seems quite reasonable for the sumptuous hunk of meat that literally falls from the bone with just minimal contact from my fork. In fact, this dish doesn't even require a fork. The meat lands in a pool of tomato confit kidney beans and when eaten together, it has the same comforting effect as a cassoulet. A spoon would do the job just fine here. A knob of baguette wouldn't hurt either. The ratatouille ($12) is the surprise winner for me. It's simple and summery, but the flavours seemingly exceed the sum of its parts; a medley of zucchini, eggplant and red peppers are roasted until sweet then topped with peppery arugula and ribbons of shaved Parmigiano. 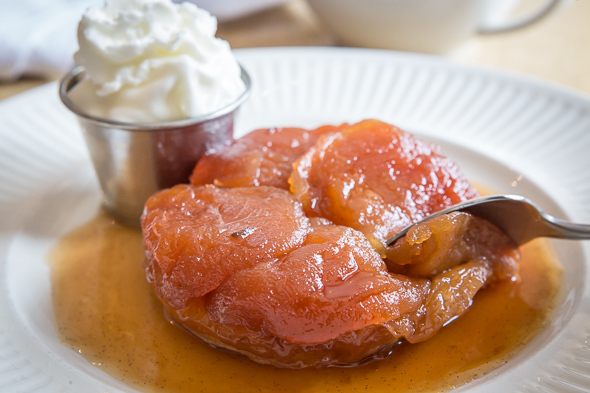 For dessert I get the tarte tatin ($7), a deeply caramelized upside down apple tart that's big enough and sweet enough to share. 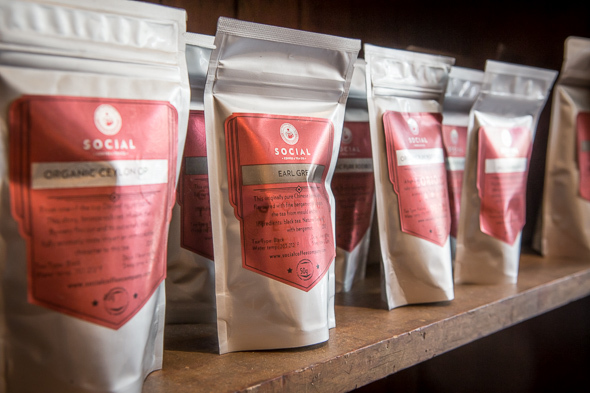 Espresso-based drinks brewed from Social Coffee beans are better than at most restaurants. The above average coffee program is of course the product of the strong daytime business carried over from Bivy. This French bistro opens at 8 a.m. most days and offers grab-and-go pastries and croissants in addition to lunch and brunch menus.